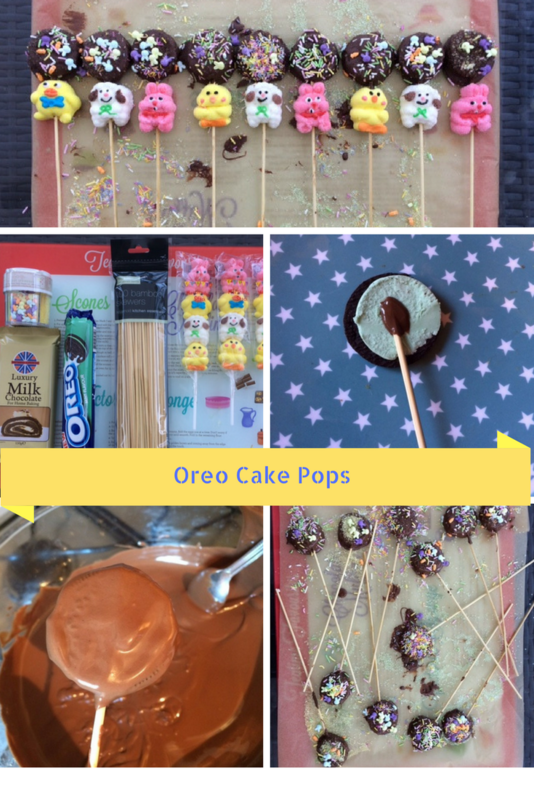 Today I thought I would share with you a quick and easy recipe for Oreo Pops. They are quick to make and the kids can help you too. Me & Harry recently went to an Easter Egg Hunt & picnic organised by the Yummy Mummies from Harry’s school and having been to a few events with these lovely ladies before they all come prepared with a basket for freshly made cakes & biscuits. By now, my loyal followers will know I am terrible in the kitchen but never one to turn up empty-handed I found the recipe for Oreo Pops and gave them my own twist. All the ingredients were bought from Home Bargains but you could buy very similar at any local supermarket.They are fun to make and the little ones can join in decorating ( and making a mess ). They taste amazing especially when you used a flavoured Oreo biscuit. Here’s how to make them. Place the chocolate in a glass dish over a pan of simmering water and stir until melted. Dip the tip of a skewer in the chocolate and place in the middle of the Oreo, replace the top and leave to set on greaseproof paper in the fridge for 20 mins. Once set spoon the remaining chocolate over the Oreo and cover in sprinkles. Add Marshmallow animals to the bottom of each Oreo for decorative effect. I hope you enjoy this recipe and if you make some send me some pictures. The messier the better the taste 🙂 I hope you all have a Hopping Easter and enjoy the day as a family. "Review : A Cracking Good Easter Deal With Zeek"
I tried to make chick themed Ines but the oreos kept breaking! You did a great job here!